Blue-green algae, also known as cyanobacteria, are primitive life forms closely related to bacteria. Blue-green algae can be found in water bodies worldwide, including those throughout Washington State. Blue-green algae contain photosynthetic pigments similar to those found in algae and plants. They may appear as single cells or groups of cells. Colonies may clump together on the water's surface to form a surface scum, which can cause water quality problems in lakes. Blooms most commonly occur in the warmer months, when light, temperature and nutrients in the water are optimal for growth, however blooms can occur at any time of year. Nutrient rich water may support rapid growth of cyanobacteria, turning the lake green or blue green in just a few days. Many species float to the surface and form a film or scum that can be several inches thick. It may be mistaken for a paint spill. The bloom may disappear after one to two weeks but if conditions are right, another bloom can occur and quickly replace the previous one and continue for several months. Not all blooms are toxic but some blue green algae produce nerve (neurotoxins), liver (hepatotoxins) as well as toxins that affect the skin and gastrointestinal tract. Toxic cyanobacterial blooms have been increasing in Washington lakes over the last 25 years. Environmental factors leading to toxin production are not well understood however it is more likely that toxins are in harmful concentrations during blooms. Signs that a bloom is toxic may be large numbers of dead fish, waterfowl, or other animals within or around a body of water. Animals found dead may have algae around the mouth or on the feet and legs, indicating possible ingestion of and contact with a toxic bloom. Only laboratory tests can determine whether a blue-green algae bloom is toxic. Blue green blooms can be a human health concern. Exposure to cyanobacteria and cyanobacterial toxins can occur through swimming or drinking water where cyanobacteria are present. You can also be exposed by breathing air that contains cyanobacterial cells or toxins. Wind surfing, jet-skiing, boating, or watering lawns are activities where this might occur. Children usually weigh less than adults, so a smaller amount of the toxin may make them sick and the toxin may affect a child's liver or central nervous system more than it would an adults. Also, children may be at greater risk than adults because they may not be aware of any health risks due to a cyanobacterial bloom and may swallow water accidentally while swimming. People fishing may be at risk. Microcystins can accumulate in fish tissues, especially in the viscera (liver, kidneys, etc.). Concentrations in the tissues would depend on the bloom severity where the fish was caught. Animals are also sensitive to cyanobacterial toxins. 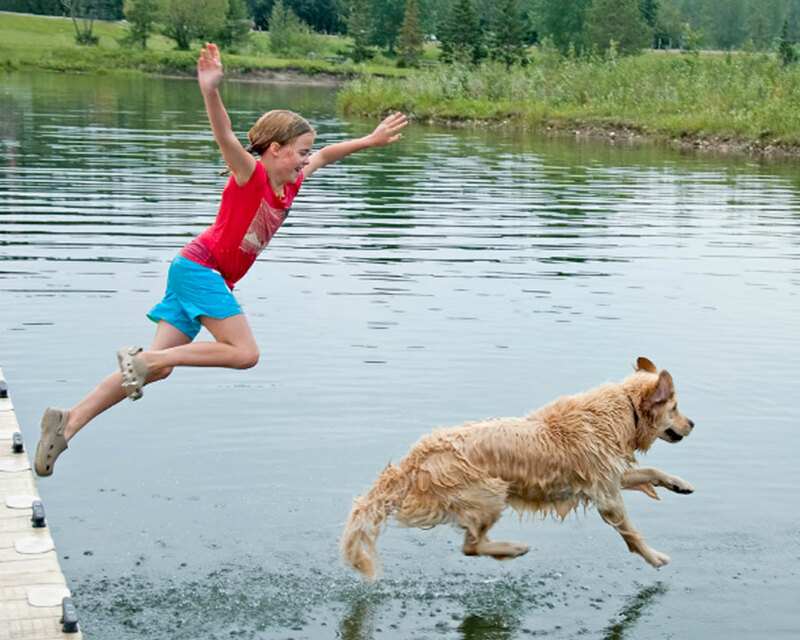 Pets and wildlife are likely to ingest algae when they drink water from a lake or pond with cyanobacteria. If toxins are being produced at the time animals drink the water, the animals can become very ill and even die. Dogs can be exposed to toxins by licking cyanobacteria from their fur after swimming. Don’t let pets or livestock swim or drink in areas where there is a scum or mat of algae on the water. If they do swim in such areas, rinse them off as soon as you can. Swimmers and water skiers may become ill after contacting water containing toxic blue green algae. It is rare, but humans may experience stomach pain, vomiting, diarrhea. People may develop an allergic reaction such as skin rash, hives, itchy eyes and throat. Long term exposure has been shown to promote liver tumors in animals. Therefore, people and animals should not drink water from a source with a blue green algae bloom. There have been confirmed pet and wildlife deaths from exposure to toxic blue green algae in Washington lakes, but there are no confirmed deaths of humans from algal toxins worldwide. For pets, symptoms of exposure to blue green algae toxins include loss of appetite, vomiting, weakness, seizures, difficulty breathing and convulsions. Neurological symptoms, including salivation, can appear within 15 to 20 minutes of exposure. If your animals show any of these symptoms, seek veterinary advice. Be sure to tell your veterinarian that your animal may have come into contact with cyanobacterial toxins. Avoid swimming, wading, wind surfing and water-skiing in waterbodies where cyanobacterial blooms are present. Avoid drinking untreated surface water. Use caution when considering consumption of fish caught in a water body where major cyanobacterial blooms occur. Before eating, remove the internal organs, which may contain more of the algae/toxin. Keep pets and livestock out of waterbodies where cyanobacterial blooms are present. Contacting us when you see an algae bloom. Taking samples and delivering them to our office in Olympia. Distributing toxic algae alerts to your neighbors. To become a Lake Watch Volunteer, you can either print, fill out and send us the sign up form or you can enter your information and submit the form electronically. Would You Like to Receive Lake Algae Updates?